Hi there. It's October 1st....and my Jordan turns 13 today so Happy Birthday to her!! 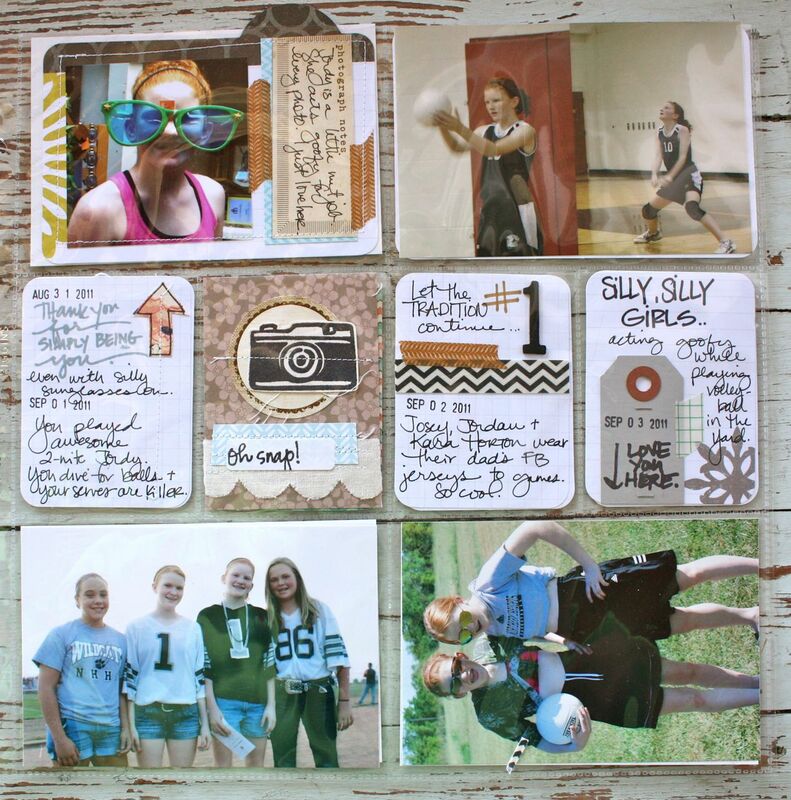 The Senior girls at Papertrey have some projects for you today. We're making holiday banners using the great banner building dies. 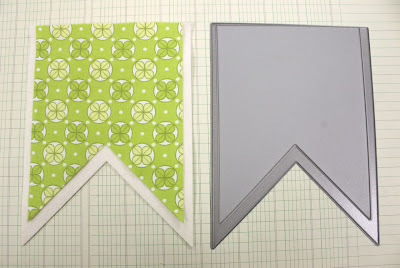 I am using the Boxy Banners set of dies for my project but be sure to check out the triangular Basic Banners and the Banner Borders at this link. 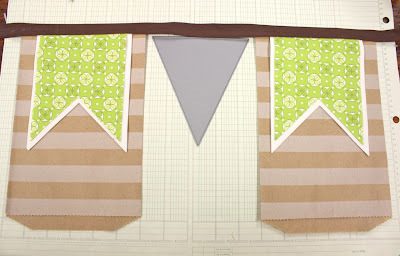 For my holiday banner...or garland as I refer to it......I started out by cutting the small and large Boxy Banners from felt and some Michael Miller fabric. 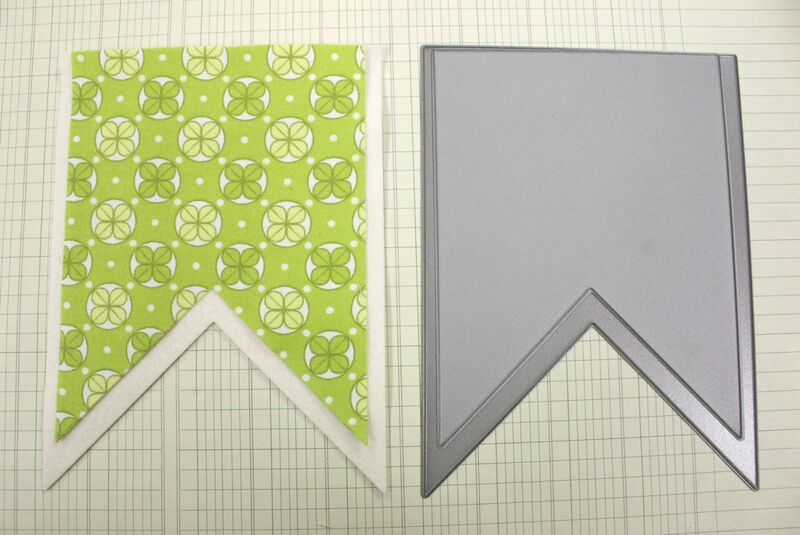 Both products cut nicely with the dies. 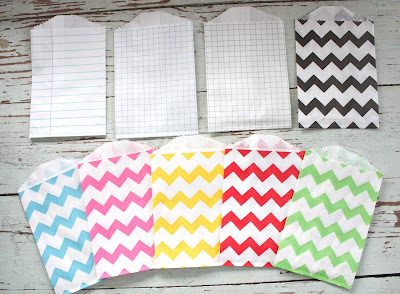 If you need to shim a little bit, start with a piece of folded copy paper, then work your way up to a thickness of cardstock if you need to. Mine cut beautifully with just a few thread snips on the material. I'm using my garland as a holiday decoration in the reds' new lounge room. I wanted to create a garland that could be interchangeable and a little bigger in size so that I can change out just one banner for each holiday/occasion. 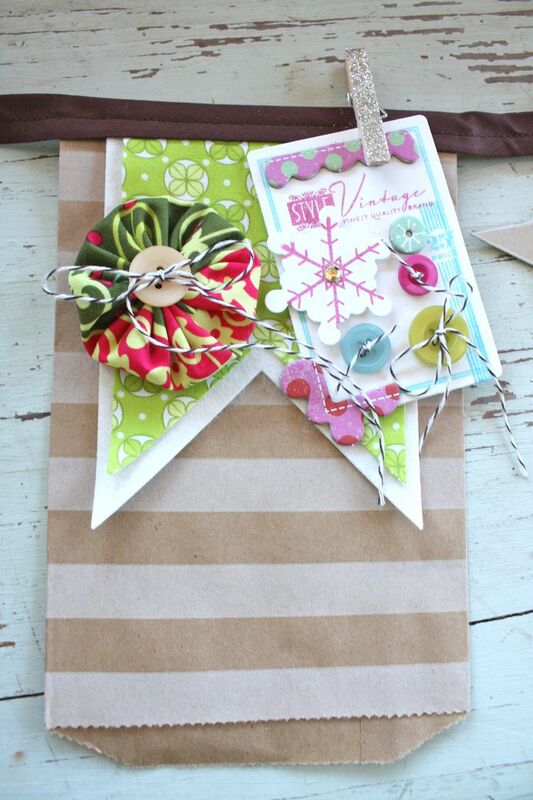 To do this, I created a paper bag base to go under each felt/fabric piece. 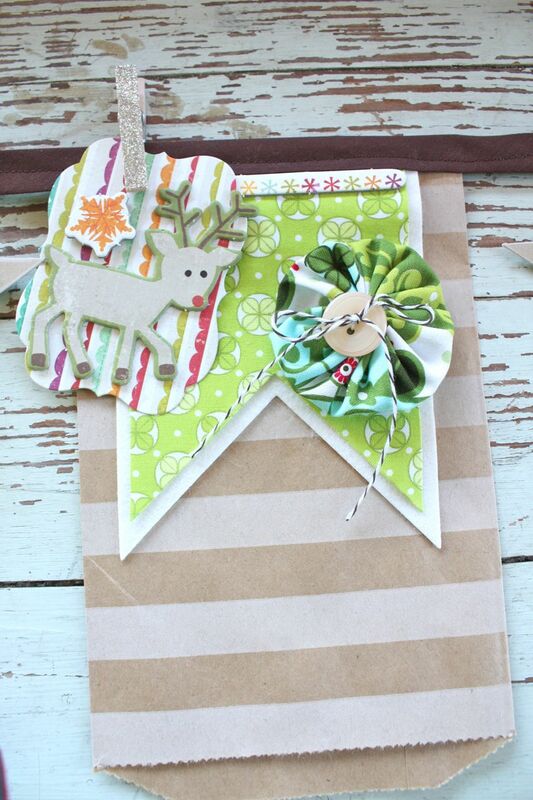 I saw this idea on Pinterest and knew that I had just the right paper bags from my shop to do the trick (more in the shop later). I used a store bought binding as the garland string to hand it on the wall. Thinking ahead, I spaced the sacks far enough apart that I could clip on additional accents like a triangular piece if I wanted to. Everything that I add from this point on will be removable by using clothespins or little clips. I knew I wanted to add my homespun flair to this project so I went to work creating some die cut star accents (from the Seeing Stars Die Collection) that are topped with circles cut from an old, tattered quilt. My mom stitched me up five pretty yo-yo's that are topped with Vintage Buttons and baker's twine from PTI. So on to the embellishments for my garland. 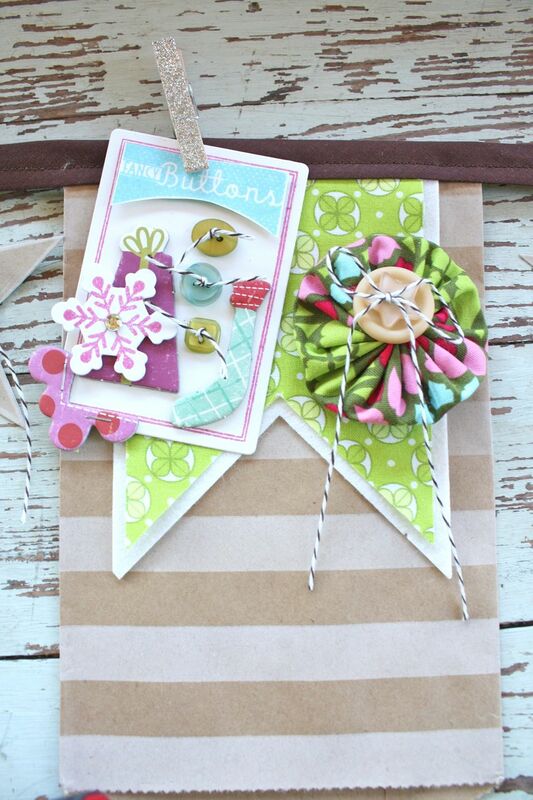 For each banner section I wanted to layer on a yo-yo + some sort of embellishment. I decided to work with Button Cards and layered PTI die cuts using a holiday chipboard line from Crate Paper. This embellished button card features die cut and stamped snowflakes from Snowfall Additions along with Button Boutique stamps and tied Vintage Buttons. 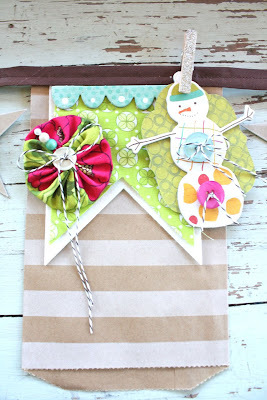 Love the cheery colors on this one. 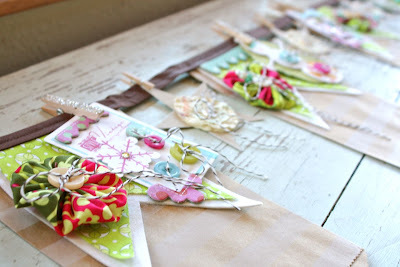 Each embellishment is clipped to the garland with a glittered clothespin. 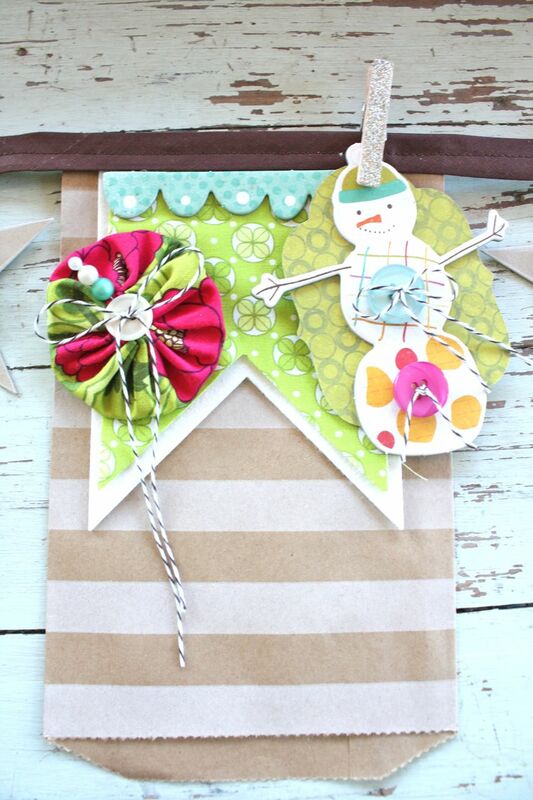 This pieces uses a Mat Stack 4 die and is layered with a chipboard snowman topped with tied Vintage Buttons. 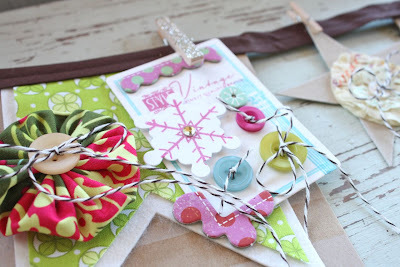 Another Button Card embellishment layered with tied Vintage Buttons, chipboard pieces and a cute stamped and die cut snowflake. The key here is lots of little layers and pop dots. Makes for major cuteness. 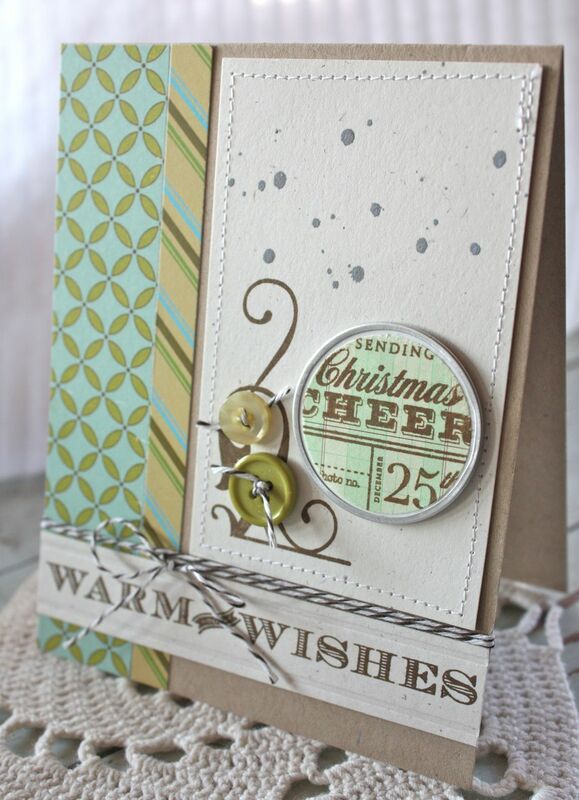 Here's another Mat Stack die layered with chipboard deer and snowflake. And another Button Card layered stamped with colorful stamps from the Button Boutique stamp set + layers of chipboard accents, buttons on a string, snowflake + glittered jingle bell. A few close ups of the button cards. Just keep adding little bits and pieces. 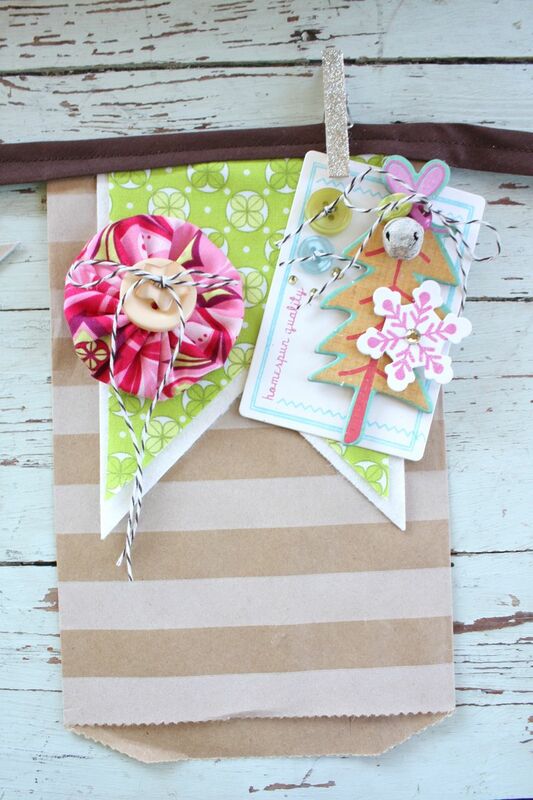 The baker's twine adds some dimension and additional cuteness. 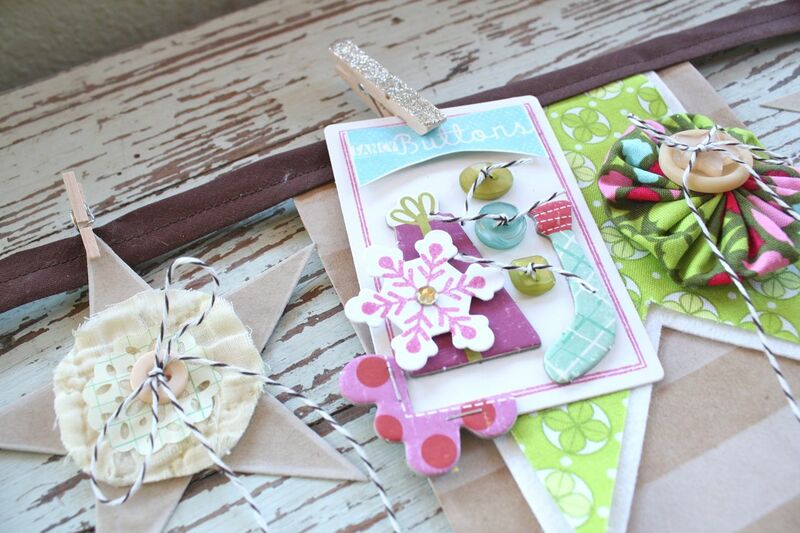 Here you can see my star accents and yo-yo's along with another button card. Add a few rhinestones here and there for extra sparkle. Love. Once I had all my embellishments, it was show time. I added the yo-yo's to my fabric piece with simply pop dots so that I could remove them if needed. The rest of the embellishments were clipped on with clothespins. And here's what the entire garland looks like spread out. It was hard to photograph on the wall due to shadows but I think you can get the idea here on my little side table. Coming soon: Halloween treat kits + Noel Notions. Hi there, I'm back today with another Project Life update. 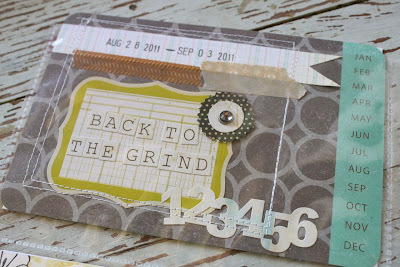 This week I used some papers that I purchased from Basic Grey from their Out of Print collection. 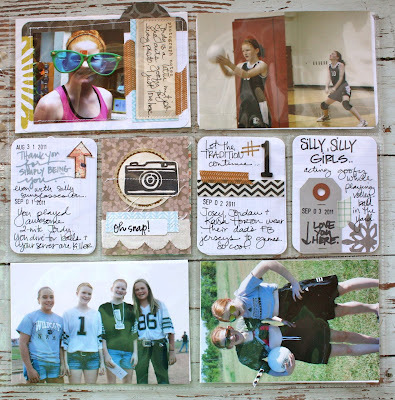 A little out of my usual homespun style but I knew these papers would be great to use with school pages/photos of the girls. And right now we're definitely into all things *school* so it worked perfectly + our school colors are black & white so the colors fit right in with this week's photos. 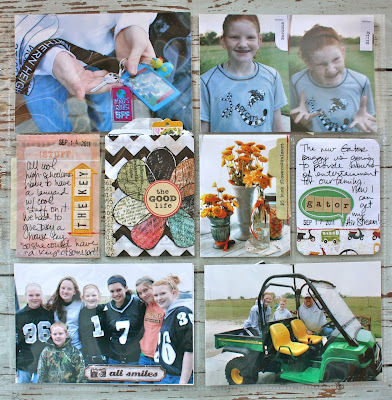 The two page spread. I love the finished 2 pages side by side because it reinforces what I'm trying to accomplish with my Project Life....more of a traditional 2 page look. For the main weekly date insert, I used that fun floral paper from Basic Grey. I cut out the flower, used a whimsical chipboard alphabet + Studio Calico butterfly mask, Mister Huey spray mist & stapled on SC chipboard butterflies. Label with *to do* was topped with small alphabet letters and stitched on with red thread because that's what's in my sewing machine at the moment. Cute yo-yo with button sits in the center of the flower. Love this whimsical look. 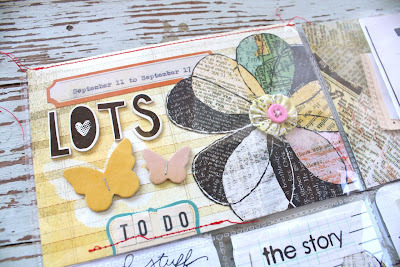 More stickers with typewriter journaling + additional cut out flowers. 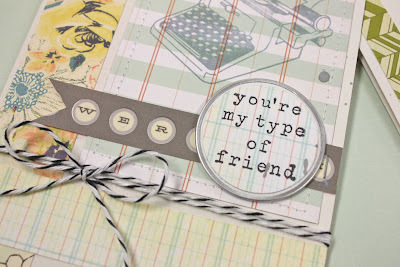 More Basic Grey patterned papers, 7 Gypsies number stamps, Studio Calico Fabrips + a favorite new product from Studio Calico.....those little sticky notes. Love them and will use them lots, I'm sure. The best part is that they are thin like copy paper so just stick 'em on a sheet of paper and they go through vintage typewriters so easily. Here I used a journaling tear off sheet from a Smash Pad + another arrow sticky note from Studio Calico. 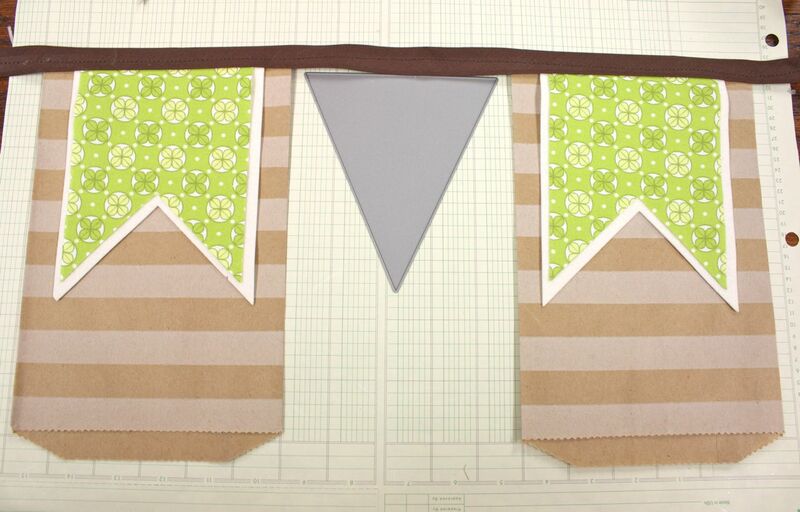 I also used a black & white chevron sack from my Etsy shop. 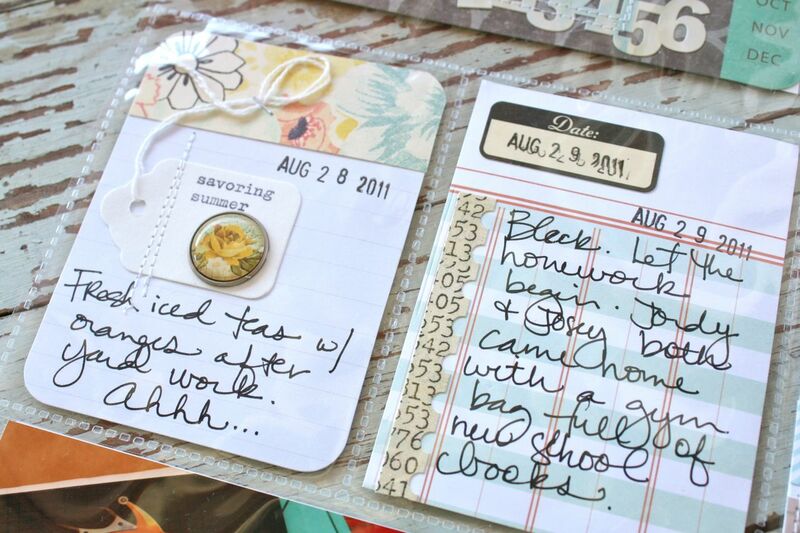 I love that they fit into the Project Life journaling pockets. I added another cut out flower + October Afternoon circle sticker + some border stickers with numbers. 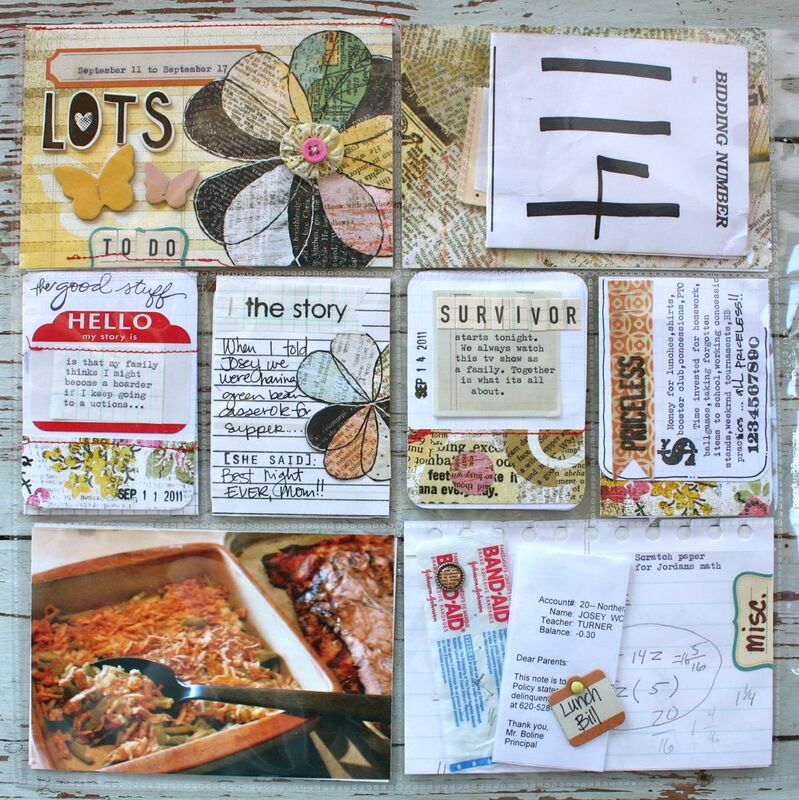 A Project Life grid journaling card is tucked into the chevron sack. 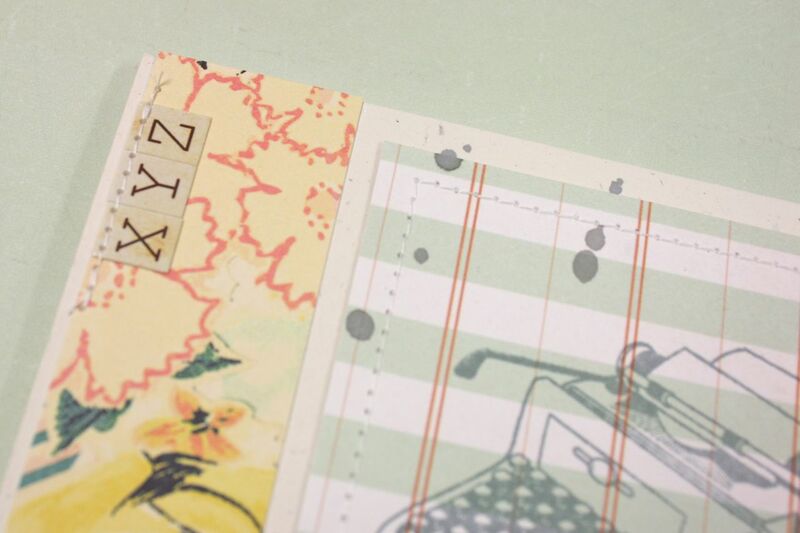 I added a scrap of patterned paper to a Studio Calico chipboard tag and stapled it onto the journaling card. Here, two entries went on one journaling card. I just used my date stamp to mark the two separate days. Here I used a small photo of flowers in a journaling card space. I typed on a Studio Calico stick note and stitched it onto the photo. 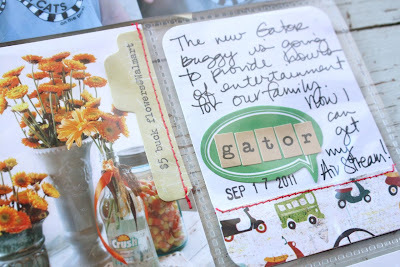 For the Gator journaling card, I used another SC sticky note that was topped with small alphabet stickers. My Project Life status: I'm keeping up with current weeks and am slowly getting a week or two done from when I got behind this summer. Loving it still! 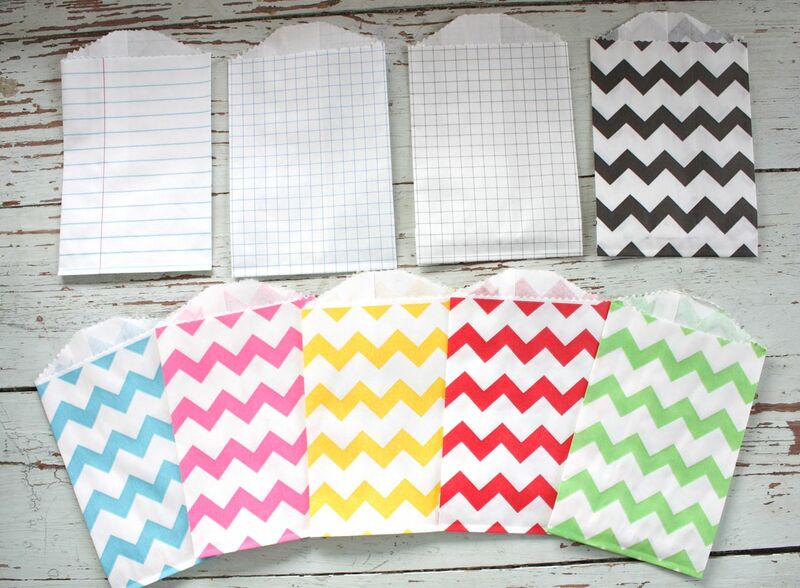 Etsy shop update: I got a new shipment of the chevron sacks + all the grid & notebook paper sacks yesterday. I'll have more in the shop towards the end of the week. Okay, off the computer now. I've got a birthday party to plan + presents to buy for a soon to be 13 year old. Two teenagers in the house come Saturday!! Have a great day everyone. 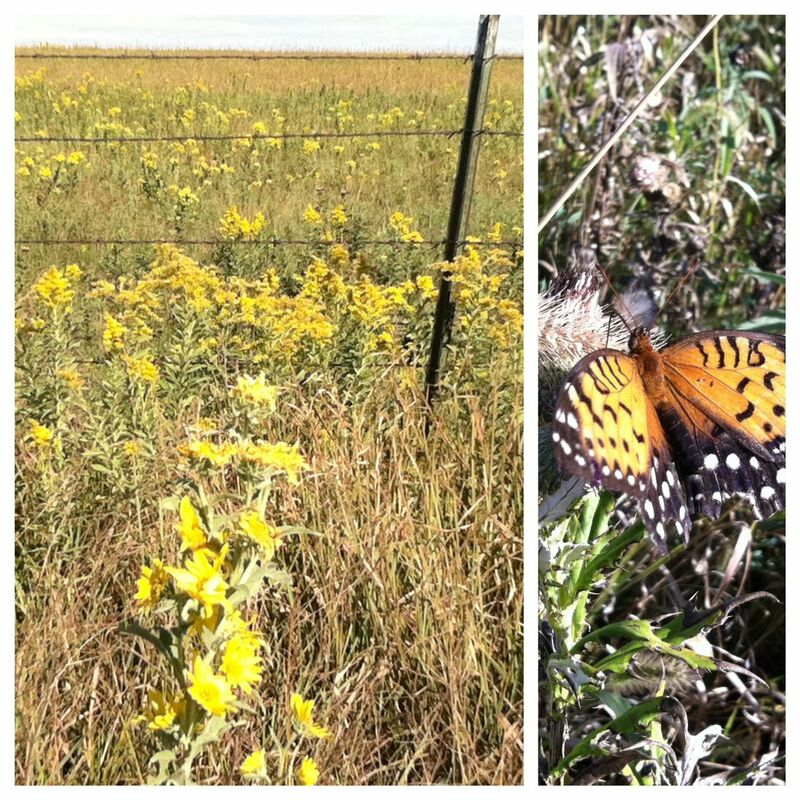 Kansas countryside......we took the buggy (the Gator) and went for a little Sunday drive through some of our pastures. I love that my dad mowed big paths alongside all the pastures. The grasses and wildflowers are all turning colors. 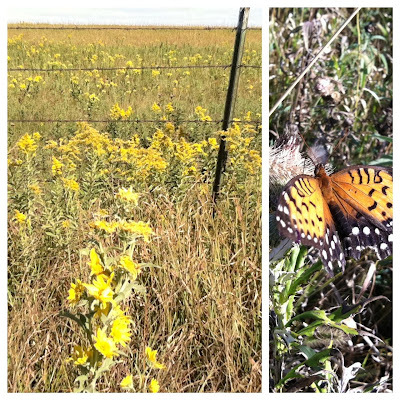 And there are an abundance of Kansas sunflowers this year. 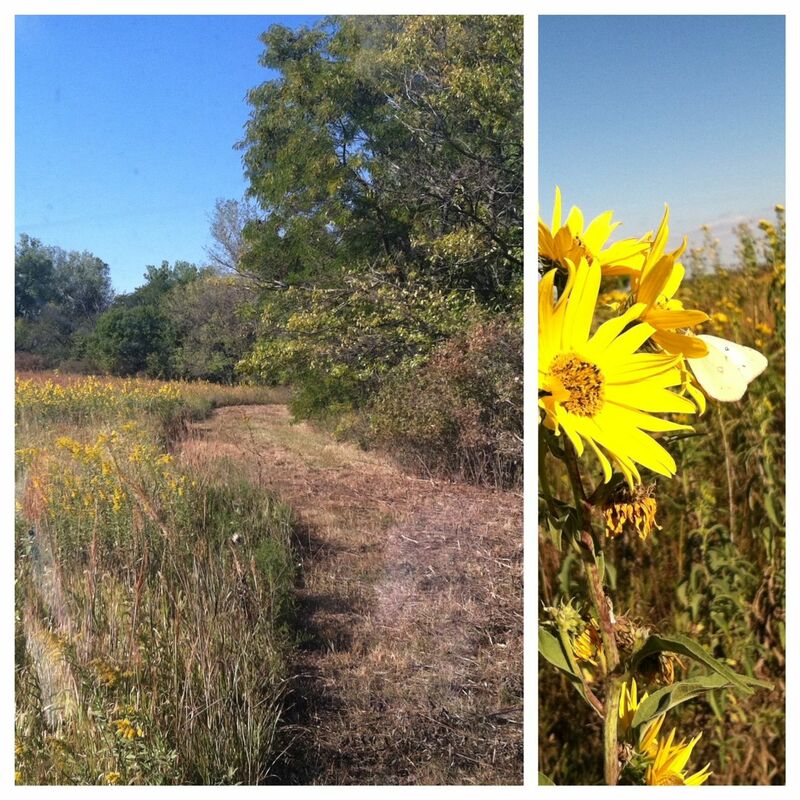 Love that the butterflies are out in full force too. So pretty to catch on film. This girl.....she makes my heart swell up so big. I get a lot of questions about how we're handing having a high schooler now. People immediately think teenagers are meant to get into trouble. Well, knock on wood, but Josey is a great kid and her dad and I are so proud of her. 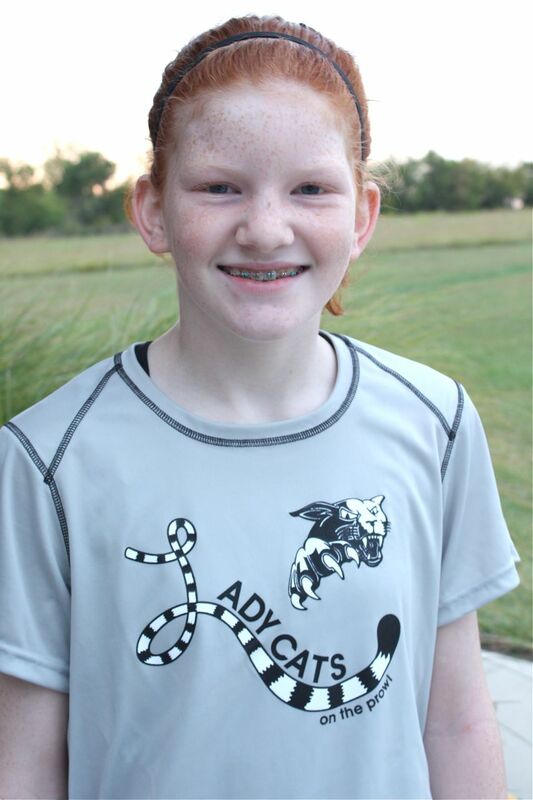 This weekend Josey's team took 2nd place in their JV volleyball tournament. 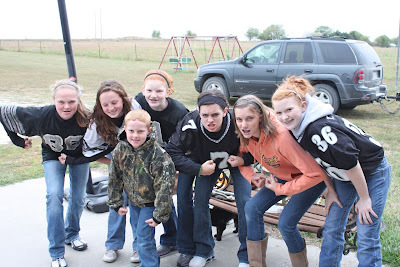 What her team mates didn't know was that Josey was asked to move up to the Varsity squad and play with them at the same time that day. Josey has worked toward this goal all season long. But she politely declined and told her coach that she wanted to finish up this last JV tournament with her team mates. So unselfish. Such a team player. So proud of her. My sweet red. 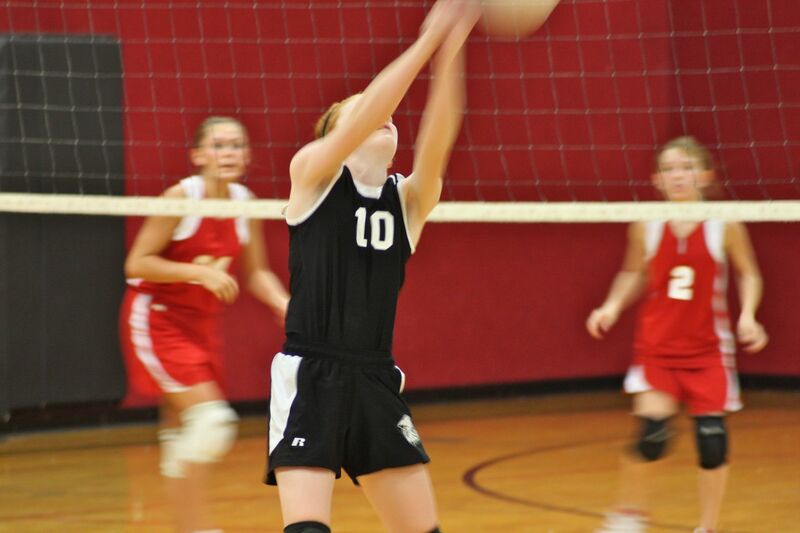 She also has been dying to see her little sis play volleyball this season. 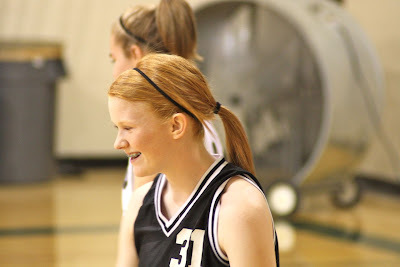 With the two reds being at different schools and having practices and games at the same time, it makes it hard for Josey to get to Jordan's games. We made a plan last week that Josey would rush out of practice, jump in the Blazer and we would scurry off to see Jordan play volleyball 20 miles away. Josey got to see her play for about 2 minutes tops. But she was happy and Jordy knew that big sis made the effort to be there. Note: We would have seen lots more of the game if that Sheriff hadn't have popped over the hill. Just sayin'. And yes, Josey has a boyfriend now. He got up early after being beat up the night before in the football game to come see her play volleyball an hour away. We introduced ourselves formally and he sat by us at the game. He's a nice boy. Other parents are nervous of this.....they see that their girls will start dating soon too. I'm a lot more calm than I thought I would be. I guess you do your best as parents to raise your kids right and then you watch them fly. You hope they rise above and soar to great things. It's all you can do. Trust yourself that you've done the right thing. And then let them go. Teenagers are great people and we need to give them a lot more credit. Note: It's not without limits here people...Josey is not allowed to go on dates or be driven anywhere by her boyfriend. I know, what fun is that!!? A lot of the worry is eliminated right there though. :) Believe me, Eric is just dying to use his line that he's practiced for years......*Young man, I've been in prison and I'm not afraid to go back! *......whatever Eric. And no, he's not really been in prison. Something crafty....I've been working really hard to get the Craft Department cleaned up. It's time. Way overdue. 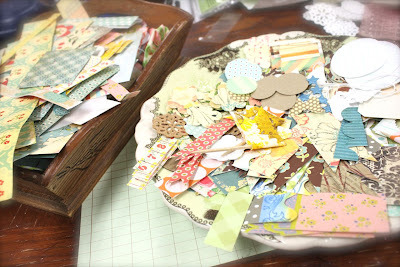 One of the things I like to do is keep all my smaller scraps of patterned paper in this little wooden tray on the left. When I have a few minutes...or perhaps need a little warm up exercise before tackling a big project.....I take the scraps and cut or punch them into little shapes. For example, the longer strips of scrap paper get turned into little notched flags. 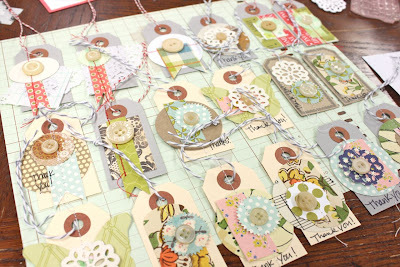 I use parcel tags from my Etsy shop to create scrappy little tags. These will in turn be taped to Etsy packages as little thank you tags. 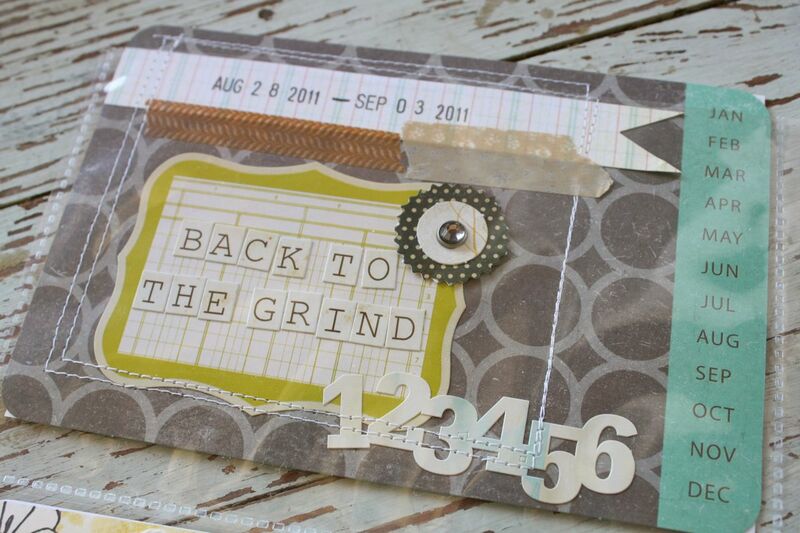 Very scrappy and I can make a lot in a short amount of time. And no adhesive is used. I layer scraps on top of tags and then sew it all down with my sewing machine. Then a button goes on top. 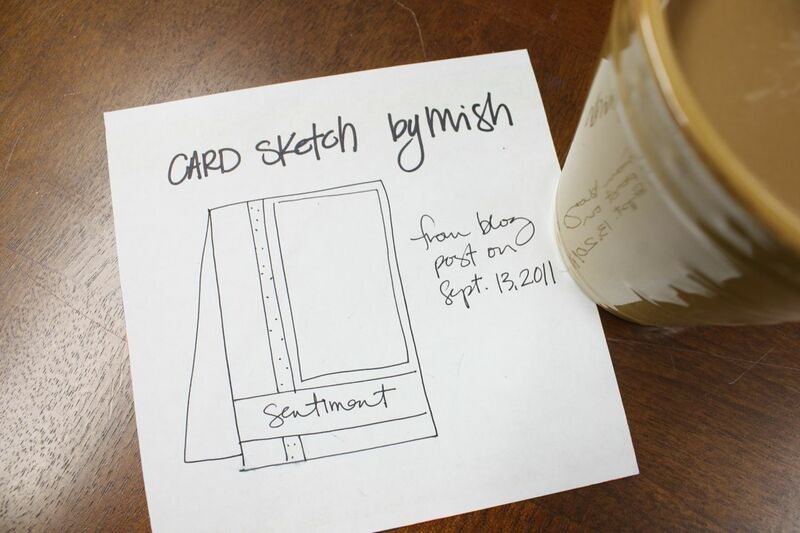 Check out this amazingly fun post by Tara Anderson over at Crate Paper. 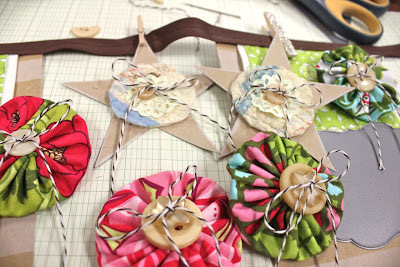 She uses her scraps in a different way by creating the cutest little garlands. I am so inspired by Tara's work. 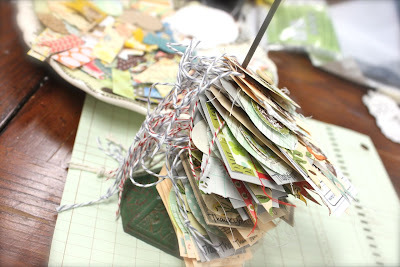 Once I get over looking at the cute tags all lined up, they get stacked onto one of my many vintage receipt spikes. They're perfect for holding my tags that go on Etsy packages. I just pluck one off and tape it to a package as a thank you. Fun stuff! Okayyyy, I'm outta here for now. After sitting on hard bleachers for 9 hours at Josey's volleyball tournament this weekend, my hip/back are outta whack. 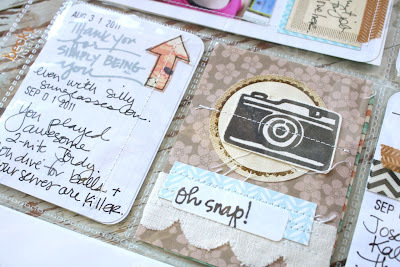 Coming tomorrow....another Project Life update. I'm on a roll! Back in stock soon.....more of the fun bags that sold out so quickly. Look for them this week in the shop. Coming soon for holiday crafting.....Noel Notions. 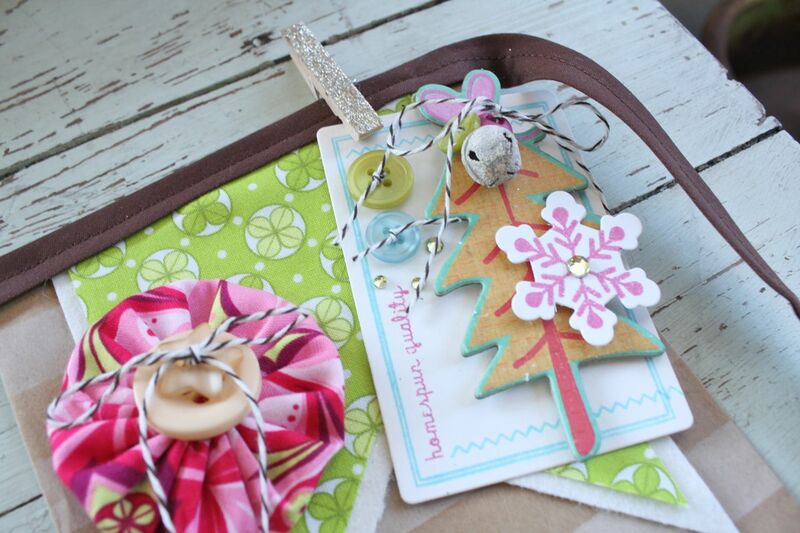 Fun holiday embellishments & notions to add to your cards, pages and gift wrap. Hi there. Today I have a project to share from my September Papertrey releases. 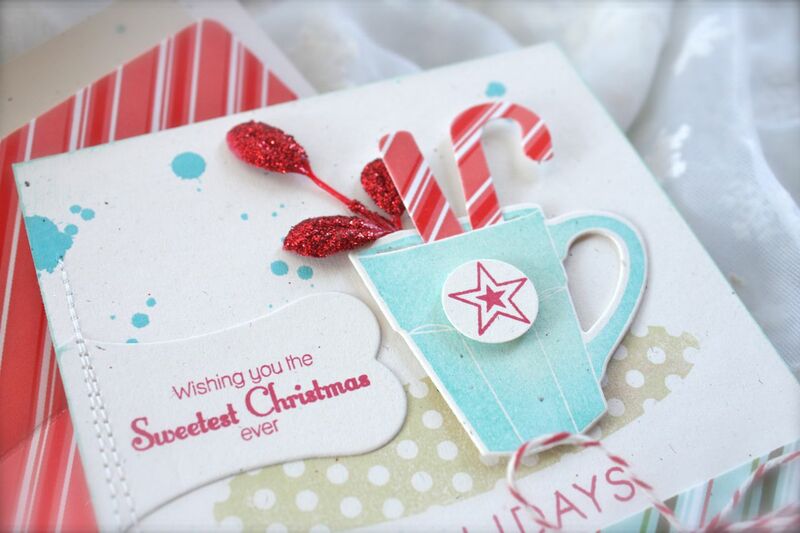 This card features a winter mug filled with candy canes and a sparkly sprig. If you love all things candy canes then Candy Cane Christmas is the stamp for you this winter. 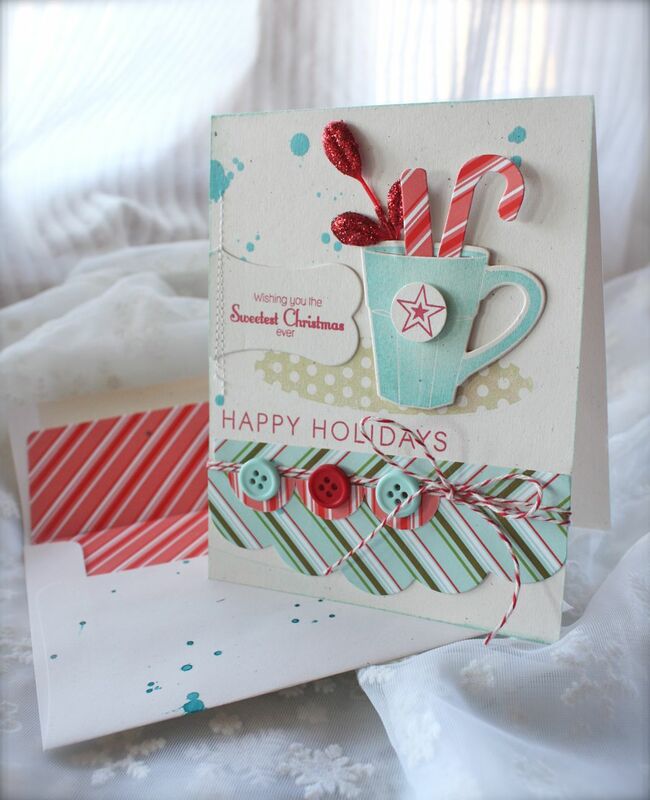 I paired it with Candy Cane Prints patterned paper and used colors of Aqua Mist, Pure Poppy and Spring Moss. I also used Christmas Labels for the sentiment and to create an oval base for the mug to rest on. 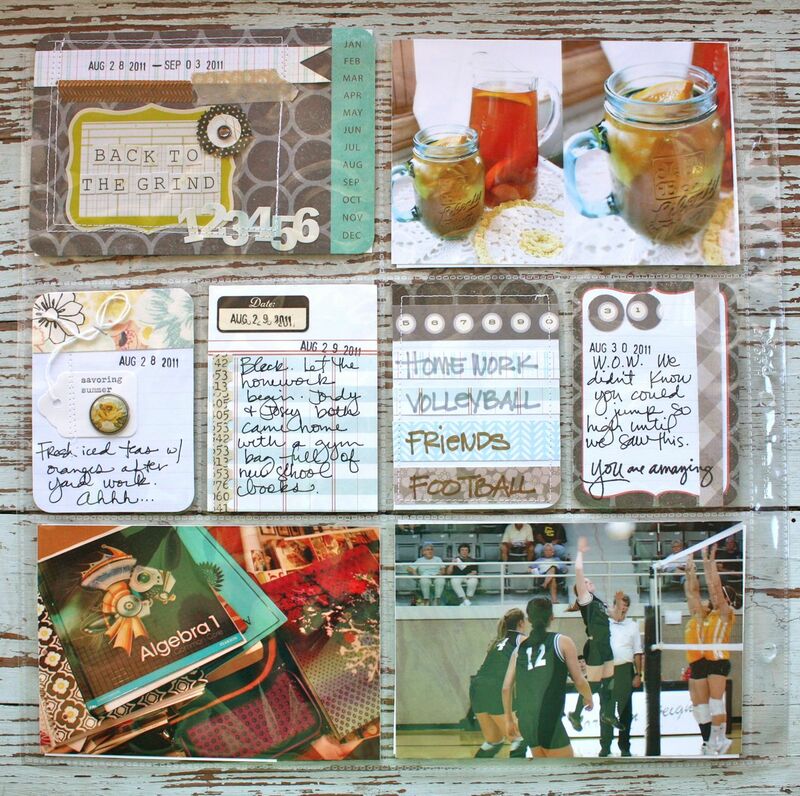 This set is a great one to add to your collection....for the holidays + every day use. 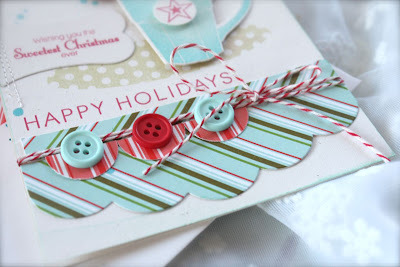 The bottom of my card features die cut patterned paper using the Edgers #4 Die + Vintage Buttons + Baker's Twine. A great holiday card + a great collection of stamps if you want to make cards well into the long winter months. Just switch out the sentiments to something like *Warm Wishes* and you're good to go. Other happenings: Tomorrow (Friday), I will be posting a sneak peek of my Holiday Journals that I will have for pre-order in my Etsy shop. All the details will be available tomorrow about ordering + shipping times. Pre-orders will start tomorrow around noon Central time. Hey guys. Follow along with me. 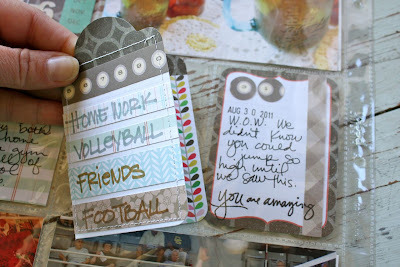 :) For this month's Papertrey release, I really loved this card from this post. 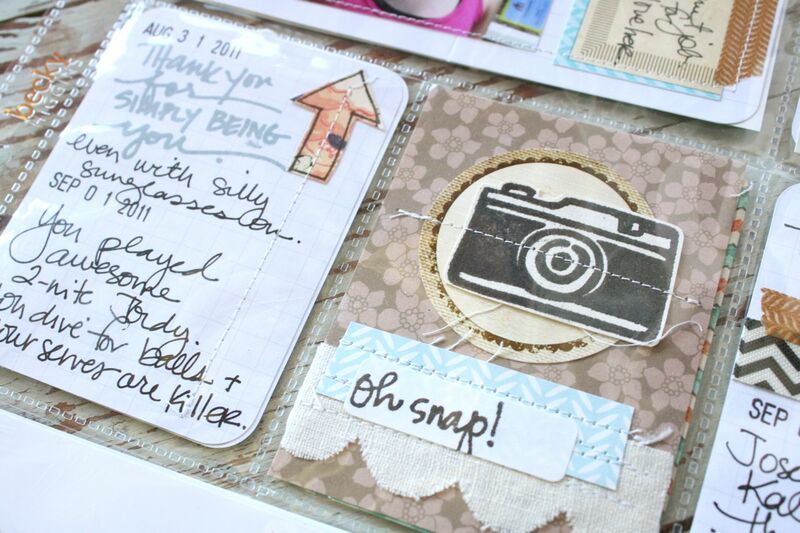 The layout was linear and graphic + it was a great way to use up small bits and pieces of scraps. So I made this sketch so that I could refer to it often. 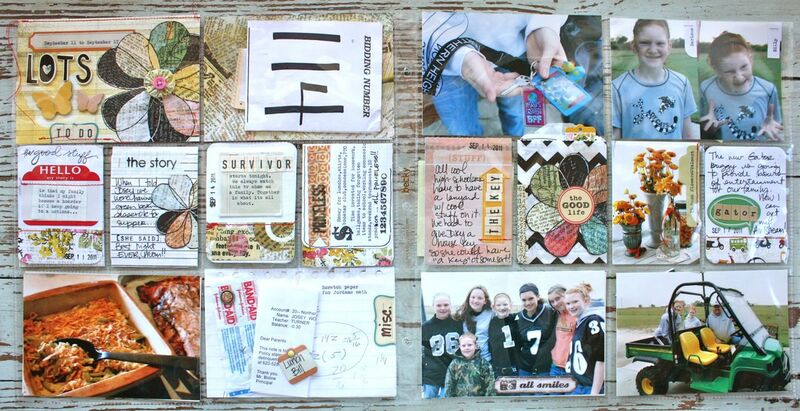 Then I made these cards + tags from all my Project Life leftovers that were scattered about my work table. The tags will be used for Etsy orders and were made from my Small Gray Parcel Tags + some fun, old fashioned yarn. 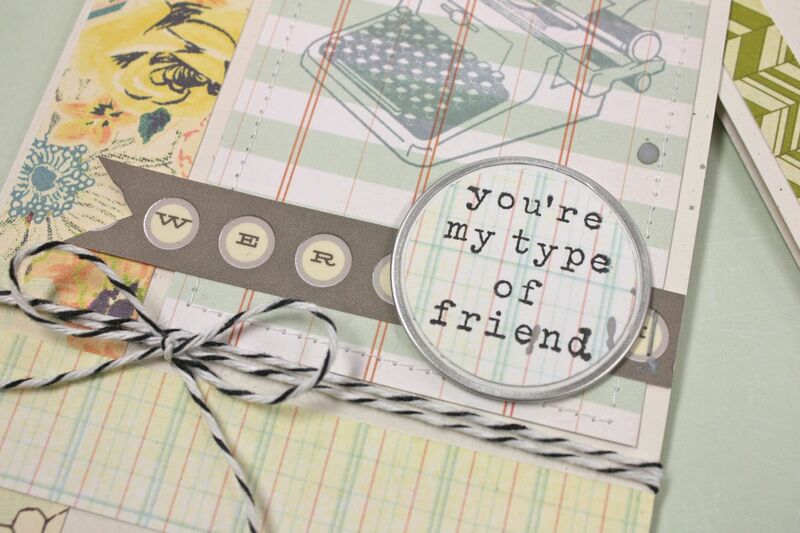 This card uses scraps from Sassafras + items from my Studio Calico kits + a typewriter image from Hero Arts + baker's twine + a White Metal Rim Tag. Love the neutral, earth tone colors. And do you have lots of tiny alphabet stickers? I know you do. Here I stitched on some letters that I know I'll rarely use. 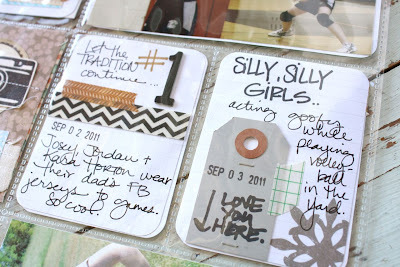 It's a fun way to add some type to projects + it uses up leftover product. 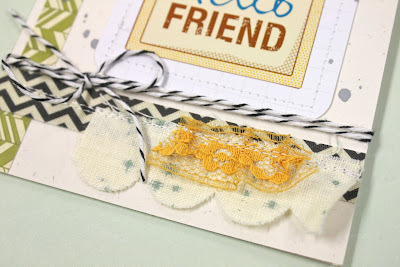 This card features more from my Studio Calico kits + an embellished Small White Tag + an Amy Tangerine sticker from American Crafts. That sticker book is jam packed with stickers. My favorite new trick is to stitch down the white tags and then staple the strings down with my Tiny Tim stapler. More baker's twine + Amy Tangerine fabric paper in the cool chevron pattern + some mistable fabric + vintage lace from my stash. All stitched down. A few sprinklings of Mister Huey on each card and these were done in a flash. Two new cards for my stash. 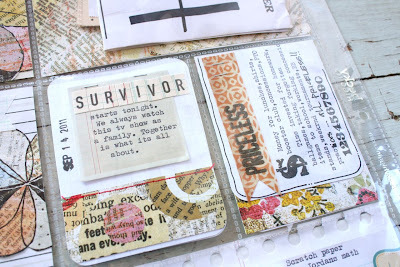 I think I'll try to make a few cards each time I wrap up a Project Life layout. It's a good plan. Hope you give it a try. Sooo, tell me. How is your Project Life coming along? Are you caught up? 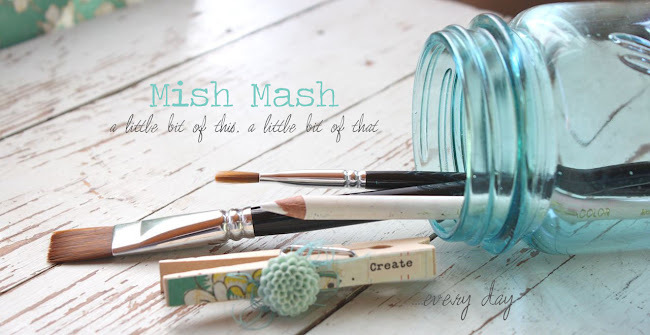 (ya right).....are you working to get caught up (raises hand).....are you loving it (that's me).....or are you just now thinking about starting Project Life (order a new kit, they're coming soon, you'll love it). Other news: All orders placed from Sunday up to yesterday from my Etsy shop were shipped yesterday. Wow, thank you for your orders. I'll be re-stocking the fun bags soon. Halloween Treat Kits: Look for some fun Halloween treat kits in the shop soon. 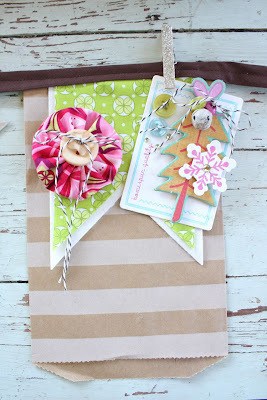 I'll be using some brand new sacks + some new Elle's Studio Halloween goodies. Holiday Mini Album pre-orders: Look for a blog post yet this week. I'll be showing a sneak peek of items from the album, including pretty papers, handmade items + more. Pre-orders will start this week. More updates to Project Life. 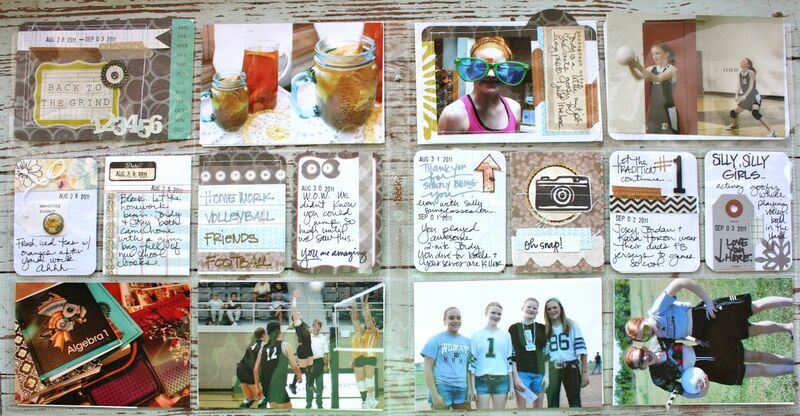 Becky Higgins is a scrapbook goddess to me. I just love my Project Life. Here's the two page spread. I worked more quickly with these two pages and they're some of my faves to date. The beginnings of school this week. Left page with title. I used lots of neutrals this time around. 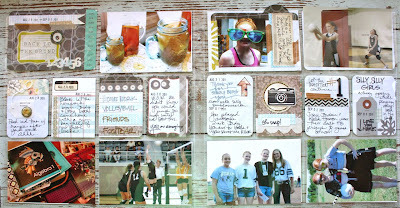 Great way to use some of my new Studio Calico kit goodies. Title insert with dates. Machine stitching, grid paper, Washi tape, My Mind's Eye embellishment, label stickers + letters. 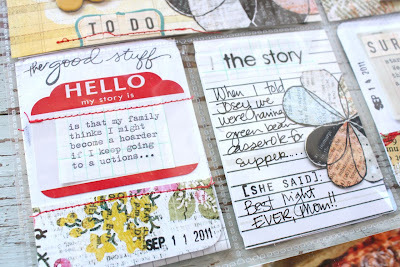 One of my favorite little ways to accent a journaling card on the far left. A large white tag with typing, brad embellishment and machine stitched right to the journaling card. Then I used my Tiny Tim stapler to attach the strings. White space is good. 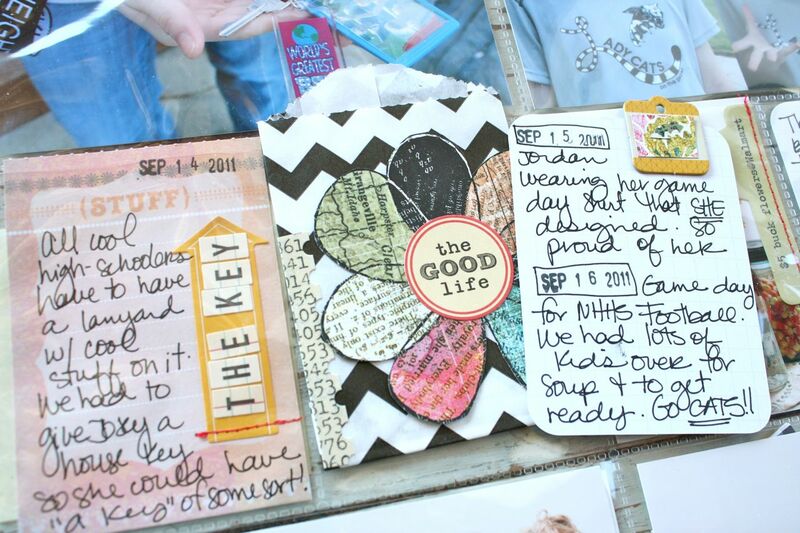 Here I used one of the folded journaling cards to highlight some stuff inside. Used my Bic markers for the words. Ali Edwards stamps on the left with date stamps. 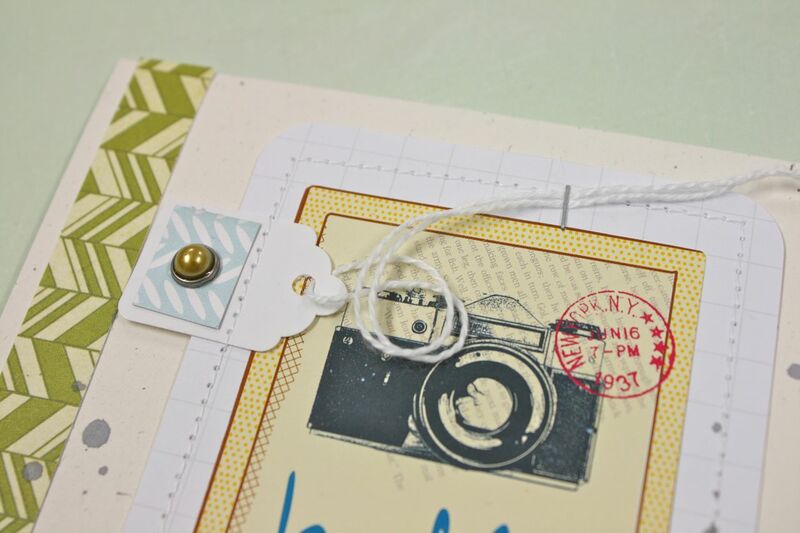 Studio Calico camera which has been embossed with gray Zing on an Elle's Studio circle tag. Plus some mistables canvas. Fun stuff. 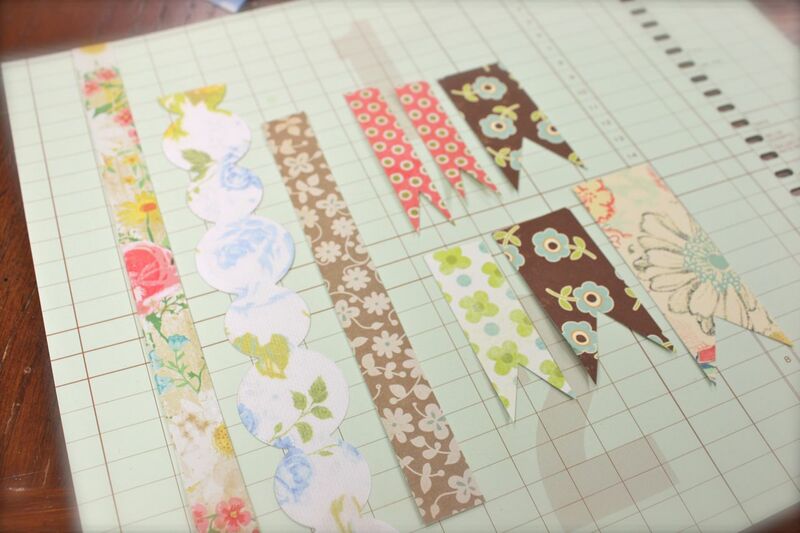 More Washi Tape, fabric paper from Amy Tangerine, chipboard #1 + date stamp. On the right card I used more of my bold Bic markers + a gray parcel tag from my shop + washi tape. 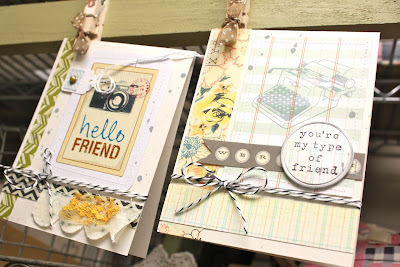 And more Ali Edwards stamps, love to use those on my journaling cards because the handwriting font mixes in so nicely. $5 buck flowers.....I pick these up at my local Walmart every other week or so. 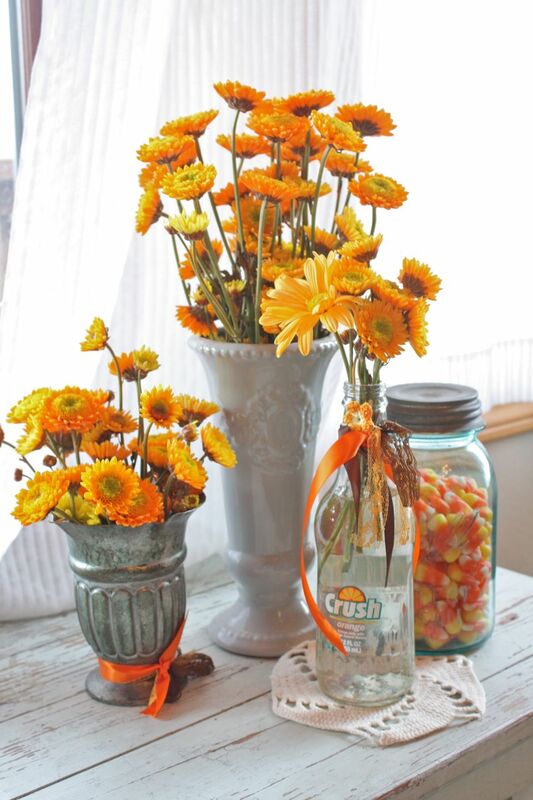 Such a nice way to brighten things up, especially when the flowers outside are slim pickin's. 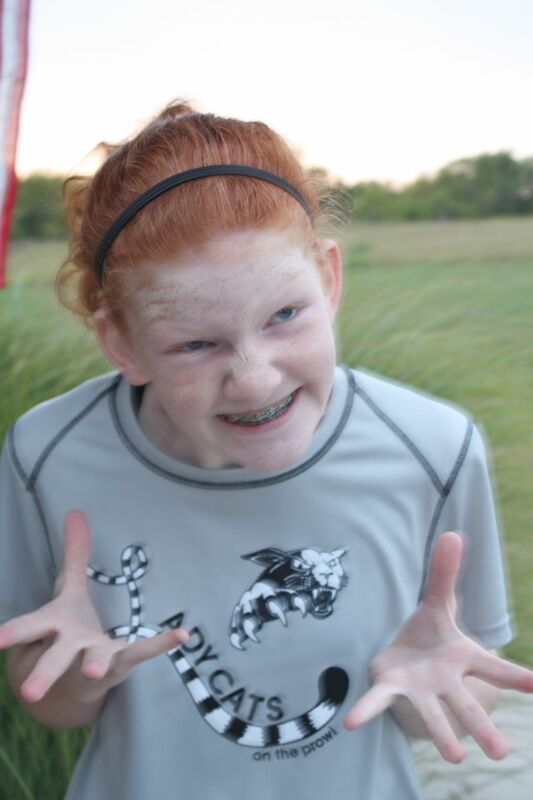 This girl...Miss Freckles Jordan. She just trucks along, enjoying life and everything that comes with it. She designed the fun cursive *L* logo + words for her volleyball warm-up shirt. Pretty cool, huh? And for every cute photo of Miss Freckles, there's one like this. Seriously goofy. She sees me coming with the camera. She's ready. Goofball. And Miss Josey Posey, puddin' & pie. Kissed the boys and made them cry. She's a high schooler now and takes the role seriously. She's got a driver's license + a boyfriend & his football jersey + a key chain *thing*. Every high schooler needs one, didn't you know? 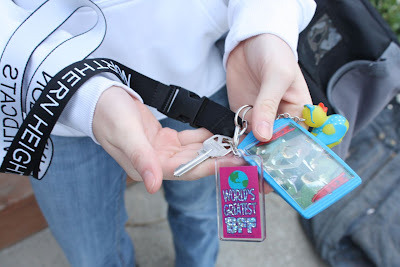 You must have a long lanyard with your high school name + a rubber ducky + some other junk on there. Oh. And a key. She doesn't drive to school. She's doesn't own a car. So we had to give her a house key so she wouldn't look like a dork with a cool key chain *thing* with NO key. And there are not too many goofy photos with Miss Josey Posey. Notice how everyone gave me their mean girl (+ cute little Coy) football stance. Not Josey. Gotta be cool like that. Ha! Down in the Craft Department, things are getting busy. It was good mail today with a special delivery of Studio Calico goodness. 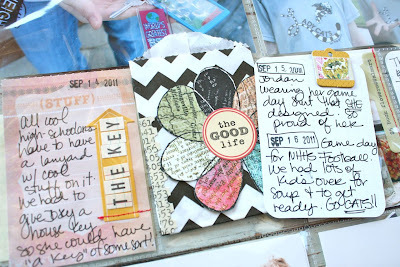 Man, there's some seriously good stuff here that my Project Life pages will love. Love getting caught up. Not there by a long shot but the process is heavenly. It's about time to start thinking of the holidays. I've just begun to assemble a very cool holiday journal that will be perfect for Ali's December Daily albums. 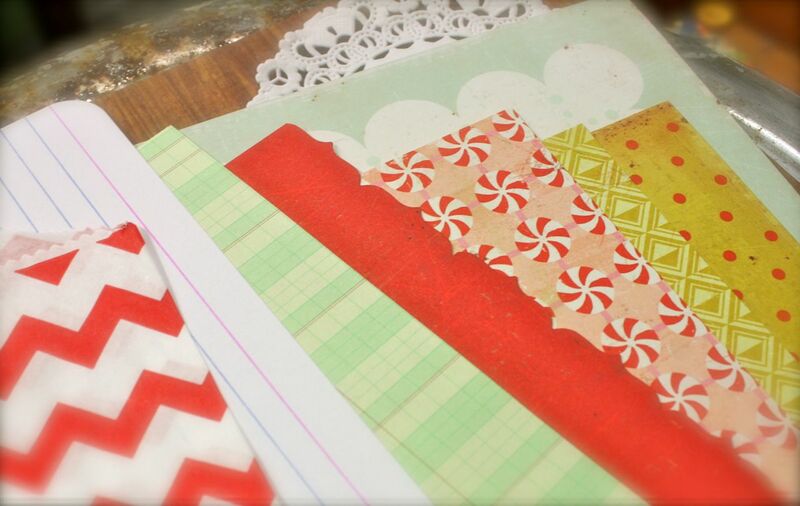 This year I'll be using the adorable paper line from Crate Paper's Peppermint Collection. 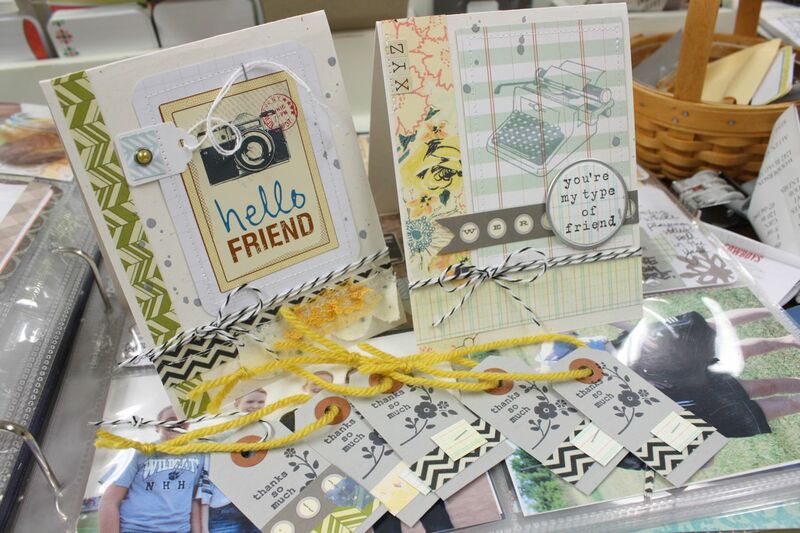 The kit will also include brand new journaling pieces from Elle's Studio's new Christmas collection + Papertrey & Ali Edwards' stamps + lots of homespun goodness. 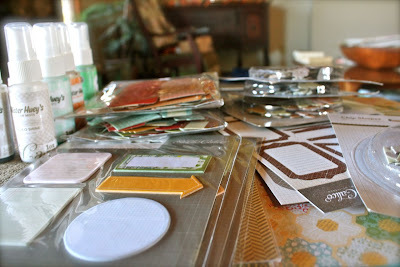 Kits will be limited in quantities & I'll be offering a selection of kits as a pre-order item in my Etsy shop soon. And a big thank you to your wonderful response to my new Etsy shop items. You can see this post to see all the new offerings. Many items are sold out but I'll have more goodies back in the shop soon. 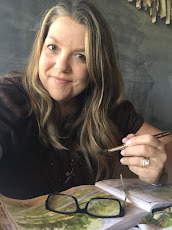 Reminder: If you want the fastest news of any Etsy shop updates, *like* my Face Book fan page and/or follow my Twitter posts...links are at the left side of my blog. I post updates there first. And for those of you that friend me on my personal Face Book page....I keep that page for my personal use/keeping track of my kiddos + school items....so don't feel neglected if you I don't friend you back. :) There's lots of good stuff going on at my fan page. Okay, I'm outta here, friends. Back to work on the holiday journals + more crafty goodness. Check back this week. 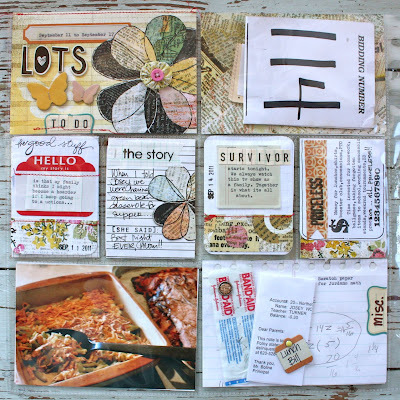 Coming up: new Project Life update + a post about my PL page process + what to do with Project Life scraps.....and more Papertrey release projects.....and more information on pre-ordering my holiday journals. Have a great weekend everyone! If you're in the neighborhood, stop by our high school concession stand tonight.....that's where I'll be working!